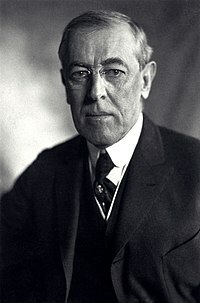 Ba é an Dr. Thomas Woodrow Wilson (28 Mí na Nollag 1856 - 3 Feabhra 1924) 28ú uachtarán Stáit Aontaithe Mheiriceá. Bhí sé i bhfeidhmeannas ón 4 Márta 1913 go dti an 3 Márta 1921. Gobharnóir New Jersey a bhí ann roimhe sin (1911–1913) agus uachtarán Ollscoil Princeton (1902–1910). Chaith Wilson a óige i ndeisceart na tíre. Bhí an Cogadh Cathartha ar siúl nuair a bhí sé 5-9 bliana d'aois. Chuaigh sé go hOllscoil Princeton nuair a thosaigh a athair ag teagasc ansin agus bhain sé a chéim bhaitsiléara amach ó Princeton sa bhliain 1879. Tugadh an leathanach seo cothrom le dáta an 7 Deireadh Fómhair 2016 ag 01:45.